The product of six years of reflection and documentation,Vital Signs takes us on a walk through one of California’s largest cities: San Bernardino—generally presented in the media as a center of urban blight and high crime. In this passionate collaboration, poet Juan Delgado and photographer Thomas McGovern celebrate the working-class Latino communities of the Inland Empire and the intensity of their stories. Pairing Delgado’s piercing poems with McGovern’s photos of hand-painted signs and murals, Vital Signs preserves the narrative and visual culture of the urban landscape and reveals a community rich in emotion and vernacular art. Juan Delgado is an internationally renowned poet and graduate of California State University, San Bernardino where he currently is a professor of English and director of the M.F.A. program in creative writing. Thomas McGovern is a photographer, writer, and professor of art at California State University, San Bernardino. His photographs are in the permanent collections of The Museum of Fine Arts, Houston; The Brooklyn Museum of Art; The Baltimore Museum of Art; The Museum of the City of New York; and the New York Historical Society, among others. His art reviews and features have appeared in Afterimage, Artweek, Art Issues, and Art Papers and in 2011 he founded the photography publication Dotphotozine. The Academy Awards Content Winners! The Friends’ contents winners were Colleen Corneille (1st place), Kerry Dunn (2nd), and Ruth Cook (3rd). Did you know the library is a great option for an inexpensive home movie night? We have DVD’s and to encourage everyone to come in and check out the collection. The Friends are also increasing the library’s DVD collection by purchasing many of the nominated films, as they become available. A binder with the new movies can be found at the circulation desk. View the article from the Redlands Daily Facts. Support the Friends of the Smiley Library by eating or shopping at Olive Avenue Market on October 18, 2017. 10-percent of sales for the whole day at OAM will be donated to the Friends of Smiley Library. Fliers will be available at the Library but are not necessary for the fundraiser. Please share on your social media. Be sure to go eat and shop at OAM on Oct. 18, and return again on another day, telling them you’re supporting OAM because they supported the Friends of Smiley Library. Thursday: Friends of the Library (FOL) members only admitted 10:15am to 11:15am and receive $1.00 discount off each book. A.K.Smiley Public Library is holding a book sale on Tuesday, July 25, 2017 from 6:00pm to 7:30pm on the library lawn across from the Redlands Bowl. This special sale occurs during dress rehearsal for the Bowl’s performance of the musical Tarzan. Stop by on your way to the Bowl and we’ll give our best Tarzan yell… when you buy a book! We invite you to attend a tutor orientation on April 10, 2017, from 6:00 to 8:00 p.m., at the A. K. Smiley Public Library Assembly Room. At the meeting attendees will find out about the Redlands Adult Literacy Program and have the opportunity to ask questions. To sign up, please contact Diane Shimota, Adult Literacy Coordinator, at 909.798.7565, ext. 4138 or email: literacy@akspl.org ! Saturday, February 4th will be an exciting day at the Lincoln Shrine, located across the park behind the A.K. Smiley Public Library. In addition to the regularly scheduled monthly book sale at the Library, there will also be a Friends of the Library sponsored book sale at the Shrine. The Shrine is also featuring its 45th Annual Open House Event. The Friends will be holding a sale of Civil War and Lincoln-related books at the Lincoln Memorial Shrine on February 4th from 10:30am to 3:00pm. Come early for the best selection, and stay for the festivities! Visit the Lincoln Memorial Shrine on Saturday, February 4 from 11:00am to 3:00pm for the annual Lincoln Shrine Open House. For the 45th year, the Shrine celebrates the life and times of Abraham Lincoln and the American Civil War with a day of music, reenactor presentations, and activities for the whole family. Renowned Lincoln presenter Robert Broski will be on hand to greet visitors, along with the 7th Michigan Cavalry on horseback and the 1st Pennsylvania Light Artillery, whose cannon demonstrations are a highlight every year. Given the success of the 2016 festivities, the Open House will once again be coupled with the annual Lincoln Pilgrimage, a program hosted by the Grayback District of California Inland Empire Council, Boy Scouts of America since 1940. Mark your calendar because this grand Lincolnpalooza is a can’t miss event! Mark your calendar now; you don’t want to miss this unique and historic activity. Look for more information in the February newsletter. The Friends of A.K. Smiley Public Library often host special events. Please refer to this page to see what is coming up! For more information, call 909-798-7685. WHEN: Saturday, January 21 from 10:30-4:30 pm. 10:30-11:30 for members of the Friends only. PHOTO: Friends of the Library Bookstore Manager Ellen Schollenberger and a few of the reasons why the Friends is having an inventory “Blockbuster Bag Sale” in the Assembly Room on January 21, 2017. It is inventory clearance time for the Friends of A.K. Smiley Public Library. To that end the Friends will hold a “Blockbuster Bag Sale” on Saturday, January 21 in the Assembly Room. This is the perfect time to treat yourself to some good reads at an unbelievable price. Bring a bag or pick one up in the Assembly Room and fill it with your choice of books, CDs, DVDs and more. The cost per filled bag is $1.00 for members of the Friends and $2.00 per bag for nonmembers. This is a prime opportunity to help the Friends make room for new donations at the bookstore while enriching your own private library at a bargain price. Don’t miss out on this unprecedented sale. The date is Saturday, January 21 in the Assembly Room. The hours are 10:30 am- 4:30 pm. The first hour from 10:30 am– 11:30 am is reserved for members of the Friends only. Not a member? Join at the door for $10 per year or $25 annually for a family membership. Members and nonmembers of the Friends are invited to shop from 11:30 am- 4:30 pm. Come and take advantage of one of the best sales of the year. All sales help to provide materials and programs for the library. Redlands Magazine will be capturing a photographic slice of the A.K.Smiley Public Library community for the magazine’s Fall 2016 issue. We invite readers, volunteers and library personnel to join us in the Assembly Room to have individual portraits taken with a favorite book, ebook (tablet) or whatever you are reading now. 2:30pm to 4:00pm Tuesday August 23, 2016. To participate: We’ll ask for your permission for publication, name, what you enjoy about the library and what you are reading. Minors must be accompanied by a legal guardian with authority to grant permission for publication. Who knows… you might be on the cover! Based on the successful first book club this past summer, the Adult Literacy Learners are starting their second book club starting in September. Beginning Monday morning, September 12, 2016 at 9:00am to 10:30am, the conversation and book club will be reading “Who Was Harriet Tubman” by Yona Zeldis McDonough. The group will meet in the Smiley Library Assembly Room. Use the South Entrance, across from the park and the Lincoln Shrine. Click here to read the Redlands Daily Facts article from June 25, 2016. If you’re like so many of us among the Friends, not only are you a voracious reader, but you’re also always on the lookout for your next good book. In furtherance of that goal, and because I’m curious, I asked Mayor Paul Foster what he plans to read this summer. Kim Green, Rebecca McCurdy and Kristen Burnham were welcomed to the Friends Board during the Annual Meeting on June 12. Kim and Rebecca have both been volunteers with the Adult Literacy Program, and Kristen has been a Bookstore volunteer. Come Tuesday, July 26, and visit the Friends of the Library book sale on the lawn of the Library, Eureka Street side, before the dress rehearsal of “Oklahoma” at the Redlands Bowl. The sales hours are 5:30pm – 7:30pm. The sale will feature Westerns and children’s books, as well as other genres and fun summer reads. Pick up a fan with each purchase and keep cool as you read and relax before the performance starts. Book enthusiasts from the Friends of A.K. Smiley Public Library joined the throngs at last Saturday’s kick off of the Los Angeles Times Festival of Books. Ever conscious of our crowded freeways, the book lovers boarded a bus in front of the library which delivered them only a few minutes’ walk from the University of Southern California’s famous Tommy Trojan statue. Readers of every sort love to curl up with a book on a rainy day. While there weren’t many places to curl up, there was rain along with over 600 authors, celebrities, musicians, artists, and chefs at the Festival. The dreary day failed to deter thousands of attendees to this the largest literary and cultural festival in the United States. Booths lined the broad walkways of the university, drawing crowds even when the occasional shower blew through. Vroman’s and Book Soup, independent bookstore icons, found ways to keep their wares dry and still entice browsers. The beautiful buildings of the campus held author panels and individual speakers. The chilly day made for pleasant dashes between venues where once cozy inside, attendees were treated to stellar authors discussing their work. Best of all, it was free, except for a one dollar convenience fee to attend the conversation panels. The prolific Joyce Carol Oates was one of the featured authors. You can find more than fifty of her books at the library, including her most recent —“Daddy Love and The Accursed.” Stan Lee drew a huge crowd, the line for book signing stretching through the festival. His book on how to draw comics, along with graphic novels and DVD’s of some of his most famous video adaptations are also part of the A.K. Smiley Library’s collection. Free books, author book signings, live music, a children’s area and food trucks made for a lively and diverse day. The carpool lane helped make the trip quick and relaxing back to the library where Ernesto Gomez showed off his new book bag. This annual trip is just one of the special perks available to members of the Friends of the Library. Annual memberships are available in the Friends bookstore on the lower level of the library. Individual memberships are $10 and families are $25 per year. Members receive up to a 50% discount in the Friends bookstore as well as discounts at a variety of special sales throughout the year. All memberships sold help to support the library and its programs. For further information on the Friends of A.K. Smiley Public Library check us out on Facebook at Friends of A.K. Smiley or our website at aksmileybookstore.com. 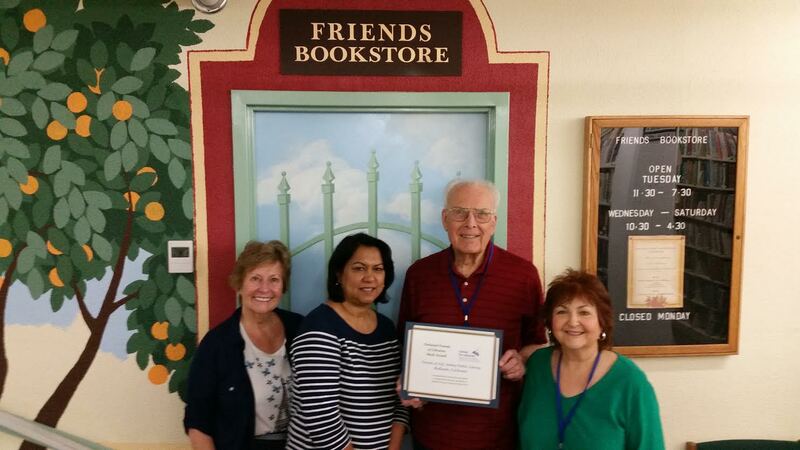 Redlands, CA (March 29, 2015) – United for Libraries, a division of the American Library Association, has announced the winners of the 2014 National Friends of Libraries Week Awards. The Friends of A.K. Smiley Public Li­brary in Redlands and Friends of the Logan County (Kentucky) Library are recipients of a cash award and certificate for their celebrations which were held in October 2014. Friends of A.K. Smiley Public Library held a Western-themed kickoff party for National Friends of Libraries Week, billed as the “Friends Roundup.” The event included author presentations, live bluegrass music, family friendly activi­ties, tabletop displays, giveaways and refreshments. During the week, the Friends unveiled a newly designed logo and brochure, new tote bags, an updated rate schedule for membership levels and fees and a social media campaign. Taking the opportunity to roll out their new publicity materials during the week helped result in increased membership and great visibility in the community. The next National Friends of Libraries Week will be held Oct. 18-24, 2015. For more information, visit www.ala.org/united/events_conferences/folweek. For more information on the National Friends of Libraries Week Awards, visit www.ala.org/united/grants_awards/friends/friendsweek. Closed on Sundays, Mondays, and holidays. The first hour is for members of the Friends only. Memberships are available for purchase. Thank you Moore Middle School for donating the books from your annual book drive to the Friends! Happy Easter from the Smiley Brothers! Photo credit from Alice-Friends Volunteer Coordinator. Congratulations to Mary Hancock, winner of the Friends DVD promotion. In case you forgot...when you check out a DVD at the library you can enter the contest to win 2 movie passes. The Friends continue to augment the collection with Academy Award winners. Tomorrow, tomorrow I Love You tomorrow because it’s Bag Sale! Fill a bag with books(any except red dots), magazines and record albums. 10:30am 1st hour for members only, $5 per bag. $6 per bag for non-members. You can join at the door. The Adult Literacy Program chose “Seedfolks” as the Community Read for 2019. The book’s message of diversity and the importance of community shares the themes so important to the Literacy program and the Library. We invite the community to join tutors and learners in reading and discussing the book. The book is available in the Adult Literacy section of the library. Stop by our sale today and say Hi to Kim and Katherine! We’re open until 4:15 today, tomorrow from 1:15-4:15.